I read the the sequel to this book first, Dreams of Joy, reviewed here. Reading Dreams of Joy made me want to know what happened before. I did know the outline of what happened before, but I so wanted to know more about Joy’s mother and aunt. It is 1937, and Shanghai is one of the most fashionable and smart places to be in. It is called the Paris of the East, and May and Pearl, two sisters are right there, living a life devoid of worries or problems. They come from a prosperous family, with plenty of household help to do everything for them. They are living a carefree life as ‘beautiful girls’, girls whose faces advertise all sorts of products, and are having the time of their life. Their comfortable lives come to a shocking end when one day, their father tells them that things have gone terribly wrong in his business and he has lost all their money. In a minute there lives have changed beyond their wildest dreams. The only way out of this mess was for them to get married to two men whose father was ready to waive off their father’s debts in exchange. Shocked and taken aback, the sisters initially try to find ways of wriggling out of their fate, only to realize that they have no other options. Their husbands are Chinese men who were born in America but came to China to look for wives. The sisters now have to make their way to their husbands. 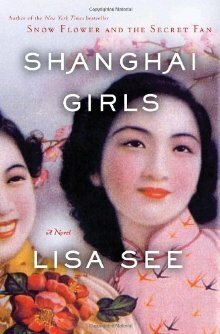 The tale of the two sisters as they travel from China to America during the war torn times, facing horrors that would stay with them forever. It follows their lives in America, as each of them do whatever they have to make the most of what life hands them. Pearl, is born the in Year of the Dragon, while May in the Year of the Sheep. May is the more flamboyant, pretty one, while Pearl, though pretty, is more sensible and responsible. Sisters, who are as close as they can be, while still having the kind of disagreements and petty envy that most siblings have. In addition to the normal things that siblings share, Pearl and May share something more, something that binds them as well as divides them, in equal measure. It is a touching and yet brave tale. I love the characters that Lisa See has etched so beautifully. Pearl with her insecurities, May with her casual and comparatively self absorbed approach to life. Narrated by Pearl, we mainly get Pearl’s perspective until towards the end, where we get a glimpse of May’s perspective. Beyond the sisters life, it also takes us through history. The time when Shanghai was a cultural hub before the socialist movement changed it all. The everyday lives and culture in China and their lives as immigrants in America. I was quite amazed by how strongly patriarchal Chinese society was/is. I knew it was, but it still is shocking to read stuff like that. I mean, if a child has to be named ‘hope for brother’, it says something about how people thought. A beautiful story. A heart-wrenching story that leaves you drained at times. A book I enjoyed as much as I did the sequel. In fact, I think I might have enjoyed it more because I already know what is coming. The book ends in a rather abrupt place, and it is quite possible that it might some readers dissatisfied, or might send them straight to the sequel. For me, it was a wonderful read. I rate it a 4/5. Lisa See is a Chinese-American author. Her books include Snow Flower and the Secret Fan (2005), Dragon Bones, and On Gold Mountain. She was named the 2001 National Woman of the Year, by the Organization of Chinese American Women. She lives in Los Angeles. This book is available from Amazon(UK) and FlipKart(India). I had some other reviews pending to be written and published, but somehow had to get this out of my chest. You know, that feeling when you have come across something really good, and you want to share it, even if it means putting everything else on hold? That. It is 1962. A time in America where black maids are employed by rich white folk, to clean their homes, cook their food, bring up their children, but aren’t trusted with their silver. The invisible lines that were drawn between the white and black women. Lines which could prove most dangerous if crossed. Abileen, is a maid working in the Leefolt home, bringing up the seventeenth white baby that she has been entrusted with. She is struggling with demons of her own, her only son has died, and it has taken her a while to get back into working. She adores the little girl she has been bringing up, but knows that it is more likely than not that this little girl would grow up to be just like her mother, despite the best of Aibileen’s efforts. Minny, the best cook in Jackson, also has the sharpest tongue amongst the maids. That has resulted in her being fired from numerable jobs, and has the most vicious of white women, Hilly Holbrook gunning for her. She has been fired yet again, and this time, she is finding it very difficult to find a job. When she does, it is only because her employer is not somebody the rest of the white ladies in town interact with. Skeeter, a white woman, just back from college, unsuccessful in the only endeavor her mother wants her to take up, finding a husband. Tall, different in looks and in her motivations from her other friends, Skeeter is lonely in her crowd. She finds some of the views that her close friends have, difficult to stomach, and realizes that she might be the only one amongst her friends who thinks this way. One of the things she wants to know is what happened to her old maid Constantine, who seems to have left her mother’s employment, under mysterious circumstances, when Skeeter was at college. Nobody seems willing to tell her what actually happened. Skeeter, Aibileen and Minny form an unlikely alliance. Spurred by their circumstances, they start a project. 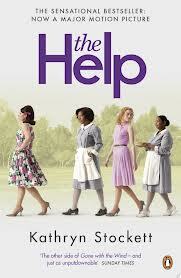 They start writing about their experiences as black maids in white households. The enormity of their task, the difficulties of getting other maids to contribute and the dangers that they were courting dawns on them very soon, but after a point, there was no turning back. Even Skeeter as a white woman faces trouble of her own, but her troubles are nothing in comparison to the troubles that could befall on the maids if they were discovered. The book is a touching portrayal of the lives of domestic help at that time. A time when they were entrusted with the upbringing of the employers children, but were still viewed with suspicion in so many ways, and yet there were households were they had sensitive and considerate employers, who would never voice out this, in the company of their peers. The racism that was an accepted part of life. Even those who did treat their maids well, accepted the lower status of their maids, without question, just because that was what they always knew. They never questioned it, because it was normal. The dynamics of society that time, the relationships, not just between the white women and their black maids, but also between themselves, inn their own society is fascinating. Politics, manouverings, class play. There are invisible lines through all classes of people, and almost everybody hankering to be in the good books of the people in power. Ultimately power play is what it all boils down. The one with most power, calls all the cards. How Aibileen, Minny and Skeeter work through it, and triumph is such a wonderful tale. The story is an amazingly positive and hopeful story, which I think drew a lot of flak from some of the reviewers who felt it was too positive, but it is still an engrossing tale, one that moves you. I’m pretty sure I can say that no one in my family ever asked Demetrie what it felt like to be black in Mississippi, working for our white family. It never occurred to us to ask. It was everyday life. the reason why she wrote the book. I had wished, for many years, that I’d been old enough and thoughtful enough to ask Demetrie that question. She died when I was sixteen. I’ve spent years imagining what her answer would be. And that is why I wrote this book. A 5/5 from me. It is a book that makes you think, and a book that stays with you. A book, I will happily re-read. PS: I couldn’t help add, some of the dynamics that were mentioned in the book, I have to say, I have seen even with our interaction with maids in India. I have come across employers who refuse the simplest of dignities to their domestic help. While it might not be a race divide in place, there certainly is a ‘class divide’ which results in people not treating their help in the same way they would like to be treated. And again. just as in 1960 America, there is good and bad, everywhere. Shoba Narayan’s memoir of her family’s Return to India process, after living in the US for about 20 years. I knew I had to read to read it as soon as I came across it. To add to it, Smita, heavily recommended it on one of my posts. I just had to get hold of it. Shoba charts her journey from the time she first started to dream about going to America. Her parents are horrified at the idea, and try everything to stop her. Fate, finally, had it’s way, and she made her way to America as a student, with stars in her eyes, all set to live the American dream. America gave her opportunities that she had dreamed about. She had come to America to pursue a master’s degree in psychology, but ended up a full-fledged art major trying to do a master’s in sculpture, For Shoba, this was the essence of America’s opportunities. As Shoba immersed herself in America, she also develops close friendships with her fellow Indian students as well as her American friends. Living her new life, the experiences of being a student on grant in America, studying subjects that excited her, finding funding and help in the most unexpected places, washing dishes to make some money, Shoba is content. Somewhere down the line, she gets married – a traditional, arranged marriage to Ram. From her happy existence in America, her perspective on living in America starts changing after she became a mother. She slowly started thinking about the ‘India Question’, with more and more of her friends and people around her talking seriously about moving back to India. The country that she had fought to leave, was now, beckoning to her. The culture and society that she had once tried to avoid, was the one she started trying very hard to inculcate in her daughter. There are some hilarious episodes mentioned of how hard she tried to make her daughter ‘Indian’. She calls herself a ‘born again Hindu’, when she drags her family to the temple, she had never before visited, or tried to wear a sari the whole day, for a month, just to make it familiar to her daughter. In her own way, trying to bring India or being Indian, closer to her American born and bred daughter. While she was passionate about moving back, her husband Ram, was more resistant to the idea. He was less bothered about the parenting worries that Shoba had. She was quite worried about how to parent her daughter, the American influences worrying her tremendously, while her husband believed that with the right values, their daughter would be fine anywhere. They had their discussions, their disagreements, and their concurrence on the ‘India Question’. Finally, after a few years, things fell into place and they did indeed move to India. So, how did I find it? I really enjoyed her perspective on life in America(or abroad anywhere, for that matter). Her observations of how people behave, some reject India completely, while others become born again Indians. The way she herself changed after her daughter was born, is quite interesting to read. In some places cliched – just the way, we have heard of NRIs behaving, and in some places interesting. When I started reading this, I couldn’t help wonder if I would find similarities in my situation with what she recounts, but I have to say, her situation, and her reasons for moving back were quite different, so I did not really relate to her story much. It was just reading her story than reading a story that I could totally relate to. Probably because we had not lived abroad for so long, nor had we ever planned to live abroad. Returning to India was a given for us, rather than a ‘question’. Also parenting worries of the sort she had, somehow, does not bother me. Influences of all sorts, would be there in any society, in my opinion. My daughter’s childhood cannot be exactly the same as mine, even if I went back to the town I grew up in, and did everything my parents did. But that is entirely my opinion. An interesting read, in some places very cliched, but pacy and gripping all the same. The way her priorities changed over the years with changes in her circumstances is very interesting to read. I would recommend it to anybody who likes memoirs although I think I enjoyed her first book – Monsoon Diary more. Would I recommend it to someone who is relocating/planning to relocate to India? I don’t know. Mainly because I could not relate to it at all, but perhaps if you are in a similar situation as her’s you might relate and enjoy it much more. Other than that, as a memoir, it is an interesting read. Recommended by Saks, it took me a while to get hold of it. And just like all the books she recommends, it was priceless. The tale of young Japanese ‘mail order brides’ who left Japan to come to America for a multitude of reasons, all believing that the migration would do them good, in one way or the other. The book charts the collective life of the brides. From the time they board the ship to the time the Japanese disappear after Pearl Harbour. 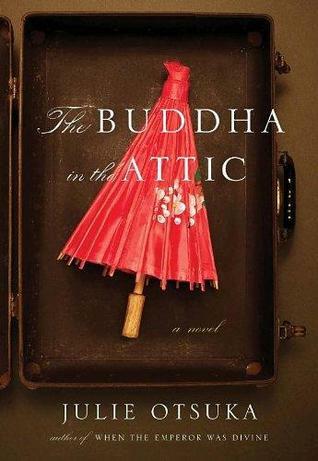 Then they all left, while one of them left behind a ‘Buddha in the attic’. All these young women, have one thing in common, when they board the ship. They are all looking for a better life. They have all a picture of their future husbands, which had been sent to them telling them that they would have comfortable lives in America. As they reach America, some of their dreams and aspirations are shattered, some are wives, some have just been sold, some are lucky enough to get what they were promised. Some were not even lucky enough to complete the journey. Some become laborers, some become maids, promised by their husbands to their employers. All of them realise that the English that they practiced was of no use. Their lives as wives, workers, mothers and immigrants in America. Holding on to their culture and beliefs, they struggle to bring up their children who are in a hurry to shrug off their cultural baggage. A powerful tale, sometimes which sometimes takes shape of a story, sometimes a poem, sometimes a collective voice, and sometimes that of an indivudual. It’s a great book, and one that gives great insight into lives of the women, and the migrant Japanese community at that time. It also gives an insight into the way migrant communities work all over the world. The style in which it is written is unique, one that I haven’t read before, but extremely effective. It brings to the reader the lives of the women in a very strong and emphatic way. A book, that will stay with me for a while. A quick, un-put-downable read. All through the book, the one question that kept pestering me was, ‘What kept me from reading Bill Bryson for so long?’ Seriously, I cannot figure it out. But then, I’ve done it before as well. I kept away from Harry Potter. No idea why. Just stayed away from it. And then when I did read one, finished four books in four straight nights. Sigh! But better late than never, right? I picked up this book on a lark, as this was the only interesting book I could find in my apartment complex’s library. After living in England for twenty years, Bill Bryson moves back to America, his home country. He finds himself a stranger in his own country. The book is a compilation of articles that he wrote for a newspaper about his experiences in America. I found it extremely funny and loved his sense of humour. A lot of his sentiments, I could identify with because when you move back into your home country after some years abroad, so many things seem different. The things you enjoyed and cherished might not even be part of your new experiences. The reverse culture shock that is part and parcel of moving back to a place after spending time away from it. Having gotten used to the British way of life and terminology, he struggles to remember/find out the American equivalent of things. His British wife and children, though, seem to love America while he seems to be the one having the most difficult time. Rediscovering America with it’s joys and it’s trials, all the while poking fun at himself and others around him, it was a fun read. I chuckled through the book. Some of the chapters, though did seem dated, after all , this book was written in 1999. Some chapters about computers for instance remind you that this book is of another time. But for most part, it is Bryson’s style of poking fun at the things he observes that stands out. The sentiments and the humour, I have to say, are timeless. Reading the reviews of the book, I realize that this might be one of his not-so-great books. If that is indeed true, I can’t wait to read his other books.